The only way to pay all these future obligations is by creating new money. I've been focusing on inflation, which is more properly understood as the loss of purchasing power of a currency, which when taken to extremes destroys the currency and the wealth/income of everyone forced to use that currency. 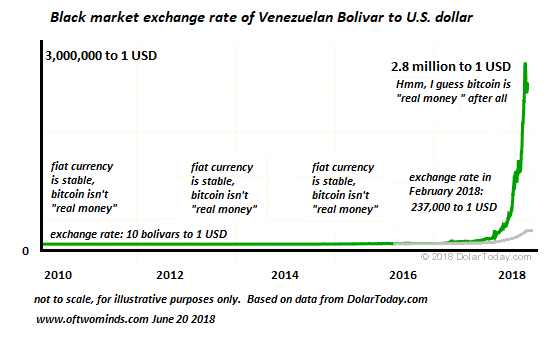 The funny thing about the loss of a currency's purchasing power is that it wipes out every holder of that currency, rich and not-so-rich alike. There are a few basics we need to cover first to understand how soaring future obligations--pensions, healthcare, entitlements, interest on debt, etc.--lead to a feedback loop which will hasten the loss of purchasing power of our currency, the US dollar. 1. As I have explained many times, the only possible output of the way we create and distribute "money" (credit and currency) is soaring wealth/income inequality, as all the new money flows to the wealthy, who use the "cheap" money from central and private banks to lend at high rates of interest to debt-serfs, buy back corporate shares or buy up income-producing assets. 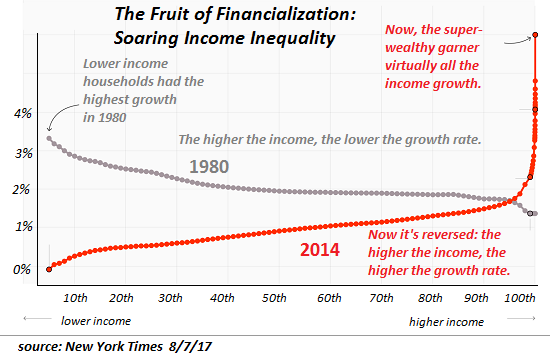 The net result is whatever actual "growth" has occurred (removing the illusory growth that accounts for much of the GDP "growth" this decade) has flowed almost exclusively to the top of the wealth-power pyramid (see chart below). 2. Much of the "growth" that's supposed to fund public and private obligations is fictitious. Please read Michael Hudson's brief comments for a taste of how this works: The "Next" Financial Crisis and Public Banking as the Response. 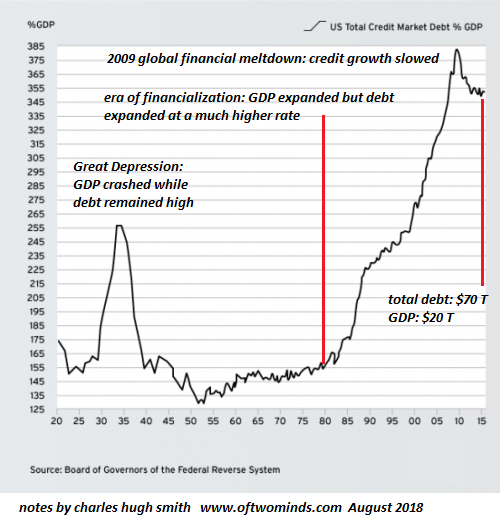 The mainstream financial media swallows the bogus "growth" story without question because that story is the linchpin of the entire status quo: if it's revealed as inaccurate, i.e. statistical sleight of hand, the whole idea that "growth" can effortlessly fund all future obligations goes up in flames. Combine that "growth" has been grossly over-estimated with an increasing concentration of wealth and income in the top .1% of 1%, and the only possible conclusion is there's less available to pay fast-rising obligations out of what's left to the bottom 99.9%. Look at the chart of federal debt and explain how the steepening trajectory of debt is sustainable in a stagnating real economy with stagnating wages for the bottom 95% of the populace. 4. Recall that the federal, state and local governments pay interest on all the money they borrow to fund deficit spending, i.e. every dollar spent above and beyond tax revenues. All that interest is an increasing obligation that must be paid in the future. Borrowing more to pay interest increases the interest payments due in the future--a classic self-reinforcing runaway feedback loop. 5. Politicians get re-elected by increasing entitlements and obligations without regard to how they will be funded. "Growth" will effortlessly take care of everything--that's the centerpiece assumption of all conventional economics, free-market, Keynesian and socialist alike. 7. The obligations that have been promised are expanding at a nearly exponential rate, as healthcare costs continue to soar and the number of government pensioners is rising rapidly. This chart illustrates the basic dynamic: the tax revenues required to fund these obligations are far outstripping the income and wealth of the bottom 95% of the populace. Consider this chart of real GDP per capita, i.e. per person. Real GDP is adjusted to remove inflation from the picture, so this is supposed to be "real growth." How many people are demonstrably 19% better off than they were in 2000? That 20% is an interesting threshold, as once federal tax burdens rise above 20%, the higher taxes trigger a recession which then crushes tax revenues.This makes sense-- if I pay an extra $2,000 annually in higher junk fees and taxes, that's $2,000 less I have to invest or spend. Put these dynamics together and you get one outcome: the federal government cannot possibly pay all its obligations out of tax revenues nor can it raise taxes high enough to do so without gutting tax revenues via a recession. The only way to pay all these future obligation is by creating new money, which in a stagnant, dysfunctional economy can only reduce the purchasing power of the currency, in effect robbing every holder of the currency of wealth and income. Here's the end-game, folks: Venezuela. The nostrum has it that "the government can't go broke because it can always print more money." True, but as the wretched populace of Venezuela has discovered, there is a consequence of that money-creation to meet obligations: the destruction of the currency, and thus the wealth and income of everyone forced to use that currency. Thank you, Piotr P. ($10/month), for your outrageously generous pledge to this site -- I am greatly honored by your support and readership. Thank you, Carol V.B. ($50), for your sumptuously generous contribution to this site -- I am greatly honored by your steadfast support and readership.